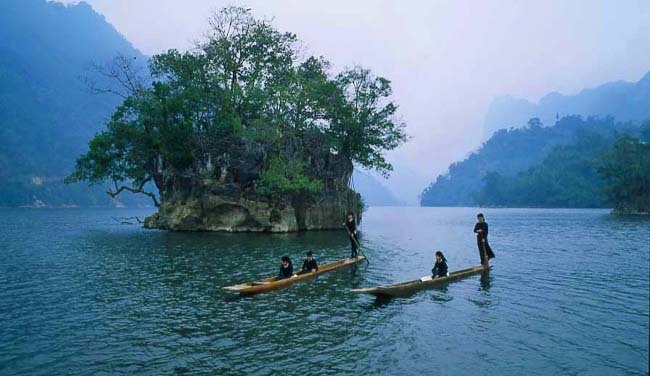 Het Thang Hen Lake - is located one hour's drive north of the provincial capital of Cao Bang. The lake is absolutely beautiful with its pretty blue / green color. If you have its chance to visit this lake, you have to in sail a small boat through deep blue / green water. The deep blue / green water gives you a glimpse into its underwater world. You can also enjoy the sounds of birds singing and breathe pure forest air. 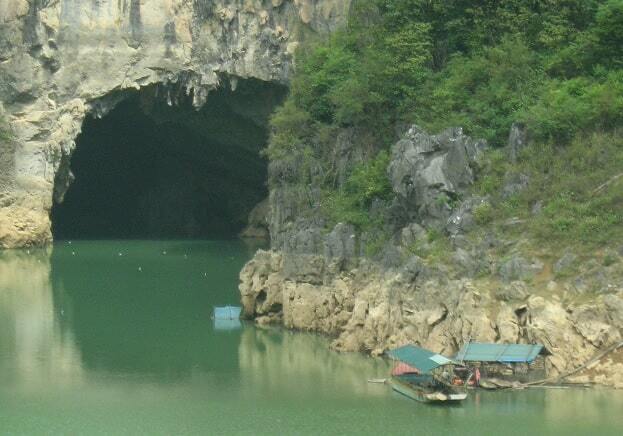 After a short time on the boat, you will sail in a small cave at the foot of a mountain, known as the Thang Hen Cave. Due to the large hole it looks like your sailing into the mouth , which lets water to flow out of the mouth. Inside you'll see the cave stalactites, silhouetted against surface of the lake. The forms give the dark cave a strange atmosphere with those plants, which grow on the rocks. The best time to visit Thang Hen lake in the rainy season (September - October). There is more water in the lake and then has a length of 3 km and a width of 1 km. In the dry season the lake is much smaller. There live around the lake ethnic hill tribe: the Tay. According to them, there is a more out of 36 different lakes, which are coupled to each other in the rainy season, because the water will rise then. Although the lake is already an altitude of 1000 meters , the surrounding mountains still reach a height of 660 meters above sea level. The mountains are covered with greenery and tall trees, which can be found along the banks. There are some trees, from which the locals say they make wine from. According to the mountainous Tay people who live here, the name of the lake means "tail of the bee." If you look down from the heights of a mountain, it really seems to resemble the "tail of a bee." There is an interesting legend about Thang Hen Lake. It is said that, long ago, in Tra Linh, there was a handsome and intelligent young man who had taken an exam (in ancient times) and therefore he became a mandarin. His reward for passing the exam, was that he was allowed to return to his village for seven days, then must return to the imperial city. Before going back to the imperial city, he met and married a beautiful lady, Bi Ooc, in his village.. Because it was so thrilled with his new marriage, he forgot to leave his village on time to the capital. Only in the seventh night he thought about it. He took leave of his young wife and her parents and hurried back to the imperial city. He passed 36 valleys, overnight climbed over rocky mountains, until he was so tired that he fell down and died unexpectedly. This is how the 36 lakes. There is also a possibility to stay minority of the Tay hill tribe. They live in houses on stilts, surrounded by a forest of hardwood trees, some of which are a thousand years old. Evening by the fire you can enjoy the corn and the sounds of the forest. In the distance you might hear someone pounding rice and sings with it. There is also a restaurant and hotel Huong Thom at Thang Hen lake. 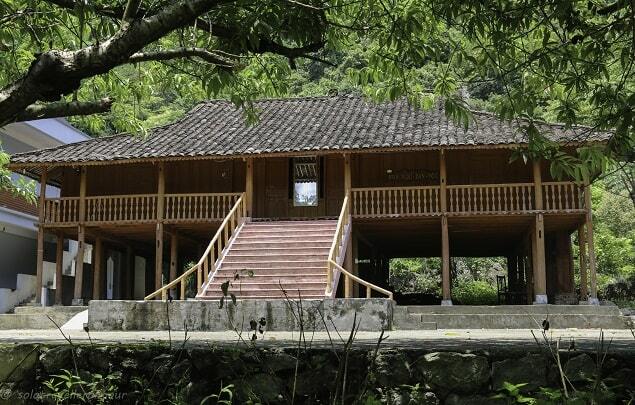 It was built in the architectural style of the ethnic stilt houses of the Tay. It is made of hardwood, which is plenty of in the area. This is the only facility for visitors close to the lake. It has been hailed by locals as one of the best restaurants in Cao Bang dishes. The restaurant was famous for its wild bamboo, special sticky rice and a special kind of leaf called "mac mat".